Although it is not common for local cowboys to rope hogs/pigs, it has been done. The problem occurs after you make the catch. Now what to do with him? 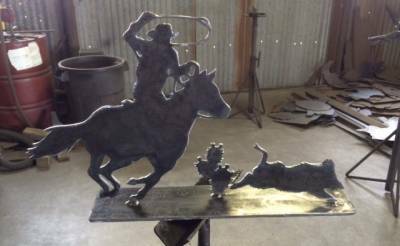 This piece was created for the La Salle county fair and hog cookoff as an auction piece. Withs a full belly of wild hog and a few cold beers, the piece may bring a fair amount. Cut from the normal 3/16" plate and painted black.